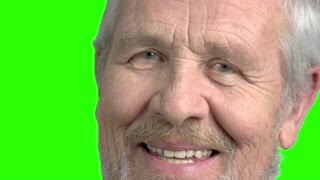 Smiling elderly man, green screen. Cheerful senior man in yellow sweater smiling on chroma key background. Human facial expressions of positivity. 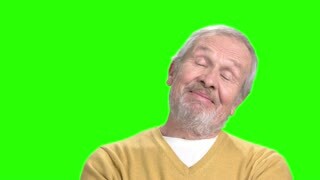 Elderly dreaming man, green screen. Positive mature man on chroma key background. Human facial expressions. Close up grey haired old man, green screen. Close up cheerful bearded senior man, chroma key background. Human facial expressions. Sleepy mature woman on chroma key background. Drowsy tired middle aged business woman yawning covering her mouth with hand on Alpha Channel background. Elegant woman is laughing on green screen. Joyful middle-aged business lady on chroma key background. Human expression of happiness. 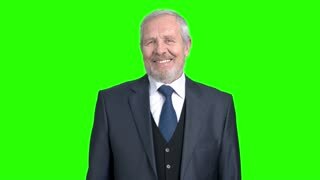 Elderly businessman laughing on green screen. 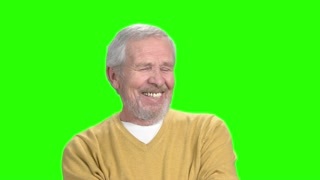 Emotional old man in formal wear laughing on chroma key background. Human facial expressions.